Oil stains are eyesores that detract from the appearance of your asphalt surface. However, what many people do not realize is that the chemicals in oil are harmful to asphalt. Left untreated, oil stains can cause potholes or cracks in the asphalt. Cleaning oil stains is an important part of asphalt maintenance that can extend the life of the surface. How Do You Handle Oil Stains On Asphalt – Ideas? Professionals can use methods and chemicals that are not widely available to the public. Therefore, the following instructions make use of only the types of equipment and cleansers that anyone can purchase and use. It is imperative that you avoid cleansers containing solvents as they will damage asphalt. You can purchase a cleanser from a company that provides asphalt installation, repair or maintenance services. You can also choose a product such as Simple Green that is widely available and environmentally friendly. You can also use liquid dishwashing soap — the kind used for washing dishes in the sink, not in the dishwasher. Fill a pail of the appropriate size with warm water. Add cleanser and stir well; you want a soapy solution, so there is no need to skimp on the cleanser. Cover the stain liberally with the cleaning solution. Give it a few minutes to work on the stain. If the solution dries before you return, add more soapy water and then proceed. You should not use a wire-bristled brush, but choose a good quality scrub brush. The ones designed for floors are often ideal. You want a brush with stiff bristles and an ergonomic grip to make the task easier. Scrub the stain with the brush. Stop scrubbing if the brush is loosening gravel or pieces of the asphalt; this means that the asphalt has been compromised, and you may need to replace the area. Be sure to rinse the area with clear water to remove the cleanser completely. You must rinse the area even if you have stopped due to damaged asphalt. If you are not satisfied with the results, you can apply more soapy water, let it sit, scrub the stain and then rinse again. Let the scrubbed area dry. Check the area to make sure the asphalt has not been damaged. If the area has softened, call an asphalt professional before you apply a sealant. Soft asphalt equals damaged asphalt, so you will need to have it repaired or replaced. Sealcoating is your first line of defense against damages caused by oil and other chemicals. 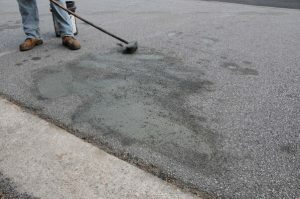 Once existing stains have been cleaned, you can apply a sealant to protect the asphalt in the future. Asphalt Pavement Solutions has more than 30 years of industry experience. We offer a full range of asphalt paving, pot hole repair and maintenance services, including asphalt sealcoating, crack repair, concrete repair and pavement marking. You can request a free quote by using the form on our website, or you can reach us by phone at (800) 559-SEAL, (856) 461-1710 or (856) 544-3990. We serve customers throughout Pennsylvania and the Camden area! If you looking for an expert Paving Contractor-Call Asphalt Pavement Solutions!